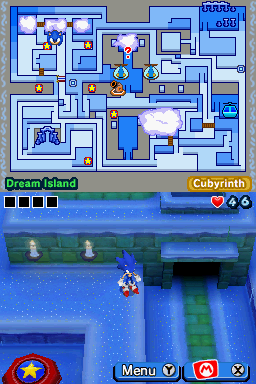 Cubyrinth is a huge snowy maze, homed by Cuby in the DS version of Mario & Sonic at the Olympic Winter Games. In this place, the player must rescue the snow spirit Icy, who was captured by Big Bullet Bill. Sonic plays a big role in this town, since there are many Springs in this location, indicated with icons (e.g. Silver's brings to Blaze's, where is the end, Blaze's to Silver's, Wario's and Waluigi's bring the player from the whole island and the others to the beginning). Here, the player can find some characters such as Birdo and Charmy Bee. Cubyrinth seems to be right above Polastraits. The name Cubyrinth is a portmanteau of Cuby (Cubyrinth's Snow Spirit), and "labyrinth" (another word for maze). One of the yellow Shy Guys in Cubyrinth is a world-class liar. One of the yellow Shy Guys in Cubyrinth always tells the truth. There's a Shy Guy in Cubyrinth who's having trouble finding his way home. Cubyrinth's name combines cube and labyrinth due to its maze-like design. Silver comes from a dark and devastated future, and hopes to bring it peace. Vector's Chaotix Detective Agency takes on a lot of jobs that don't make any money. This page was last edited on August 4, 2017, at 12:02.